What are the key differences between a junior, mid-level, and senior UX designer? I think most people agree that years of experience has little correlation with level of talent. Paired with the right mentor, grit, and tenacity, I can easily imagine a junior designer quickly becoming a star performer. In examining this question, I’m less interested in hard UX skills (at least for now), such as the ability to conduct a usability study, create actionable personas, or design truly mobile-first experiences — and instead am focused on soft UX skills. I’ve been fortunate to work alongside a wide range of UX designers — from mentoring those just starting out to learning from rock stars. Below are the soft skills and points of view I have observed at each stage, but would love to get your input. Tweet me @KristineRemer. To work at any level of UX design requires critical thinking skills, the ability to see patterns or interpret data to make sound decisions, curiosity, empathy, the ability to work well with others and follow an established process, and open-mindedness. *Each row isn’t exclusive, of course (i.e., senior UX designers still embrace UX best practices). How do mid-level designers make the leap to senior-level, or can they? Another question I’ve been thinking about is: what are the specific competencies of the UX designer who creates merely “usable” experiences vs. the one who creates “delightful” experiences? And how do they make that transition? Jared uses the analogy of a hotel shower to describe a “satisfactory” experience: ensuring all hotel guests have enough hot water at all times. To continue using his same analogy… A “delightful” experience might be a shower that is programmed to a hotel guest’s exact preferred temperature within seconds of turning on the shower. Junior and mid-level UX designers stop solving the water temperature problem when all guests consistently have hot water. They see “no hot water” appear over and over in CSAT surveys, and then solve that problem. Mid-level designers will have more experience to solve the problem more elegantly or more easily than a freshman designer. Senior designers observe the same frustration in CSAT surveys, but ALSO go back in time to when the frustration occurred. Advanced UX designers look for subtle (or not so subtle) emotions or behaviors users may not even be aware of themselves, such as nudging the shower handle back and forth until they find the optimal temperature. These designers make the leap from designing “satisfactory” hot water to “delightful” hot water. Not all problems need senior-level UX. 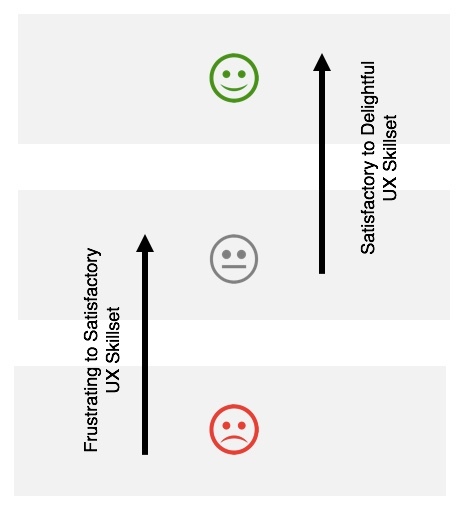 However… if a company assigns a junior or mid-level designer to a problem, they may miss out on the opportunity to transform a satisfactory experience (sustained revenue) into a delightful one (incremental revenue).